1. Amazon Fire TV ($30 off): This is pretty good deal on this set top box from Amazon, even though the device is a couple of years old at this point. 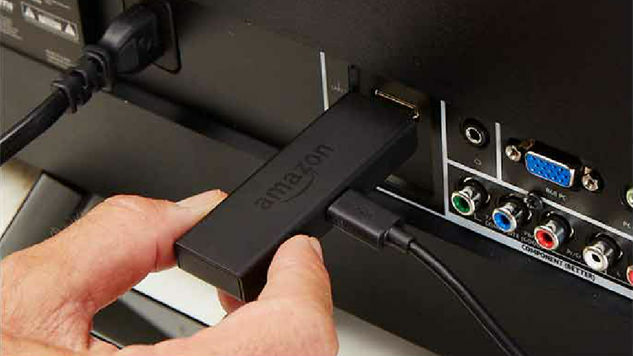 As opposed to the Fire TV Stick, with this product you get access to the gaming side of Fire TV, as well as the additional processing power that comes with it. 2. Surface Pro 4 with Pen and Type Keyboard ($979): It's nice to see a little drop in price for the Surface Pro 4, since it doesn't get one too often. It comes with both the stylus and the Type Cover keyboard, so if you've been eyeing this fantastic 2-in-1 device, this might just be the time to spring for it. 3. NIVIDA Shield TV With Controller ($50 off): Shield TV is different from other Android TV boxes in that it's made for gaming on the big screen, both for mobile games and through GeForce Now, NVIDIA's game-streaming service. It goes on sale at 8:55am PST and will stay up for 6 hours (or until it's sold out). 4. Amazon Fire tablet (starting at $33.33): The Fire tablets are going to replace your iPad anytime soon—or even a high-end Android tablet. However, if you're looking for a dirt-cheap tablet to have around the home or for your family, the Fire tablets are a good option. Check out the cheapest one in this deal starting at just over $30! 5. Kindle Paperwhite ($20 off): The Kindles have always been the best devices in Amazon's devices—and the Paperwhite is one of the very best of readers in their lineup with enough battery life to last for weeks and weeks on one charge. 6. Samsung Curved 55-inch 4K Smart TV ($649.99): This 2016 model of the curved Samsung Smart TV comes in at a really great discount, so if you don't want to wait for Black Friday and don't mind getting a TV in the mail, this is the first one we'd recommend from the Amazon Prime Day deals. 7. Amazon Echo ($50 off): The newest device in Amazon's lineup is the Echo, which is an interesting device, but hard to explain. It is made to be placed in your living room or kitchen and the idea is that you can talk to it and interact with it like you would your smartphone through Siri or Google. The benefit of it being something in your house is that it can connect with smart devices you've got around the house and act as the hub of your smart home appliances. More than any of that though, it's also a fancy toy you can impress people with. 8. Fire TV Stick ($15 off): If you're looking for an easy way to get Netflix and Amazon Prime (as well as a bunch of other stuff) on your television, the Fire TV Stick is one of your very best options. It's selling for so cheap at this point, you might as well get one—even just to have with you on the go. 9. RIF6 Cube Projector: When we reviewed this tiny little projector earlier this year, we found a lot to like. It doesn't project in 1080p, but considering the fact that it fits in your pocket, it's hard not to want one for camping trips and personal movie theaters. At over $100 off, the price makes this little projector a great buy. 10. Jaybird X2 Wireless Sports Headphones ($35 off): We all love a good pair of wireless headphones and the Jaybird X2 are just perfect for runners and athletes—and now it finally has the perfect price to match! Amazon Prime Day is upon us—actually, it starts at 3am tonight (Tuesday, the 12th). What is it? Well it’s “Black Friday” type deals day that was started last year. The deals are for Amazon Prime members only—though you should be doing that for the 2-day free shipping anyways. As would be expected, the deals were made up of a lot of Amazon-specific items and most of them sold out quickly. This year, we’re hoping for a better turn out, but so far there’s a few things that stand out. A lot of this will probably sell out quickly, so grab ‘em while they’re hot.